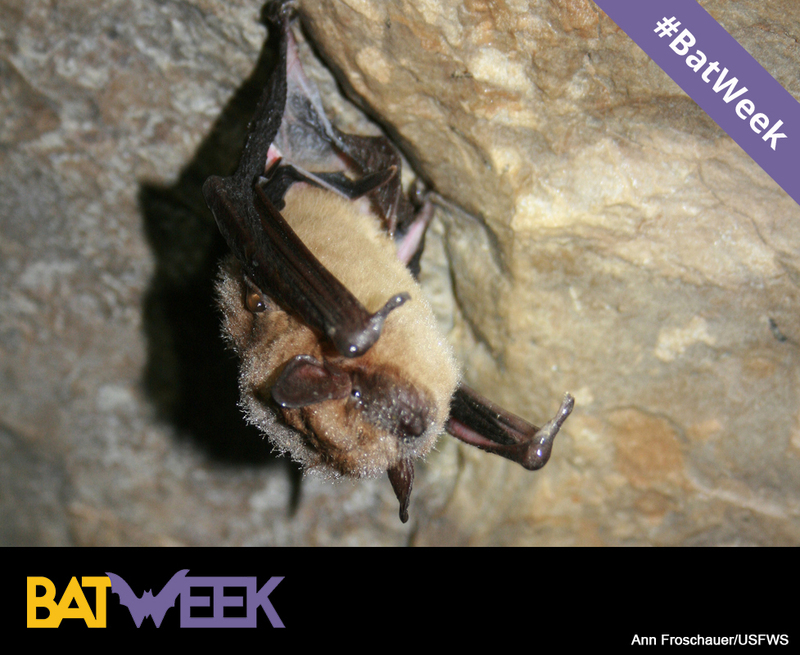 Bat Week continues… In Part 1, we talked a little about bats, and their importance to the environment. We then followed the intrepid Heinz Refuge Bat Team into the field to search for these important critters by recording their high-pitched echolocation calls. 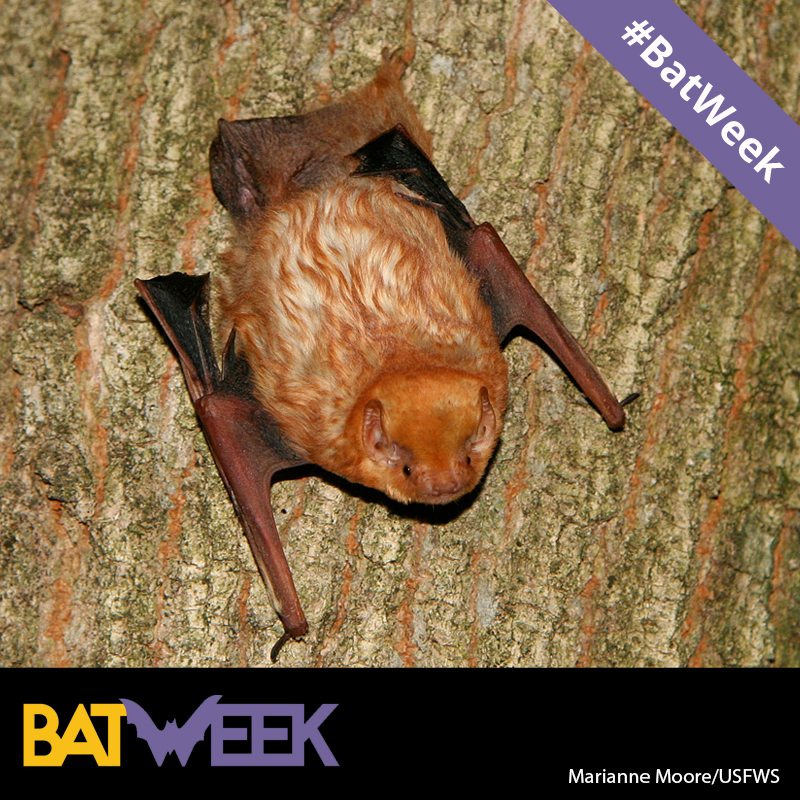 Just in time for Halloween, a whole week devoted to bats. Thin leathery wings. Oversized ears. Pointy teeth. Silent nocturnal flight. Do bats give you the heebie-jeebies? Hello, my darlings! C’est moi, Madame Catbird, gossip maven extraordinaire! I’ve got all the latest celebrity dish from John Heinz National Wildlife Refuge for you, right here on KRTR 99.9 FM, Critter Radio. It’s the season for love, and all that results from love, and don’t I have the juiciest tidbits for you today! 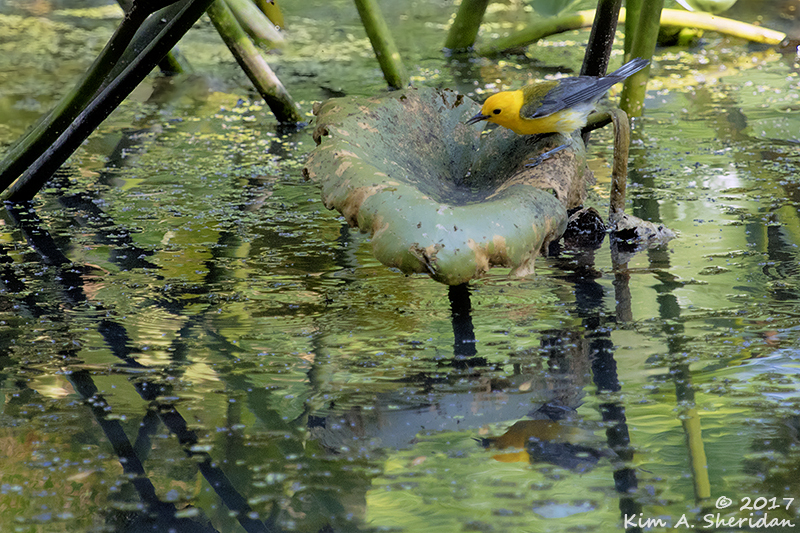 Everyone, simply everyone, is talking about the handsome young Prothonotary Warbler laying it all out for romance in the impoundment. He’s doing everything right, dearies! He’s found the most-coveted property in town, and decorated with the best moss. Look at him singing his blessed little heart out. It’s not all about home decor and show tunes, though, and he isn’t afraid to show his masculine side! He’s carried on a relentless aerial battle with the local tree swallow families in the vain hope of having the tony neighborhood of Horseshoe Cove to himself. The paparazzi have been camped on the doorstep of our golden boy for weeks. Who will be first to get that money shot of the lucky Mrs. Prothonotary? Only time will tell… but time is running out if Mr. P. hopes to hear the patter of tiny feet in his waterfront mansion this summer! Guess who else was caught on film this week, my lovelies? Yes, those reclusive songsters, the Marsh Wrens. We are frequently graced with their operatic voices, but not their feathered fabulousness. They much prefer the quiet life at home in their posh upscale development, The Reeds. Not so now. 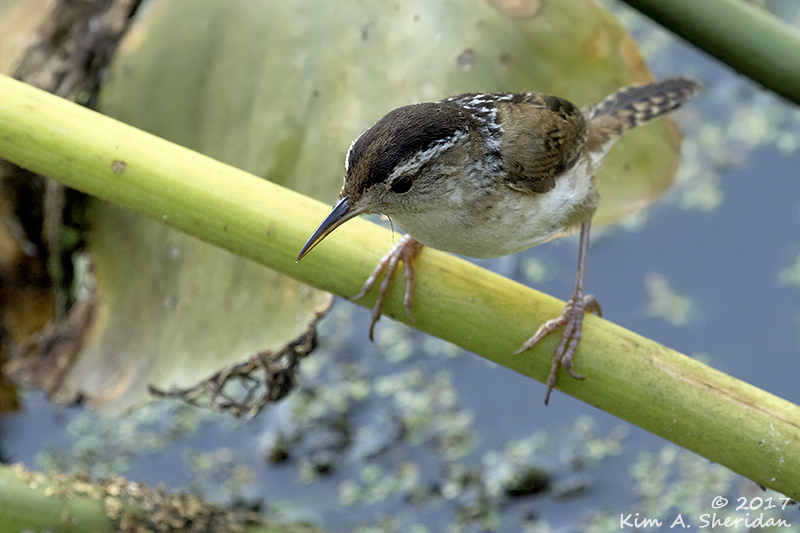 The Wrens are busy, busy, busy, plucking bugs from the spatterdock and carrying them off to The Reeds. Why, could it be? Do they have a bun in the oven – or chicks in the nest? Madame Catbird thinks so! Surprising to hear that the Least Bitterns have been out and about in public recently. They are notoriously camera-shy, don’t you know, dearies. They’ve taken the art of dodging the flashbulbs to new lengths. “You can’t see me,” says our plumed contortionist. Let’s leave them their little illusions, shall we? 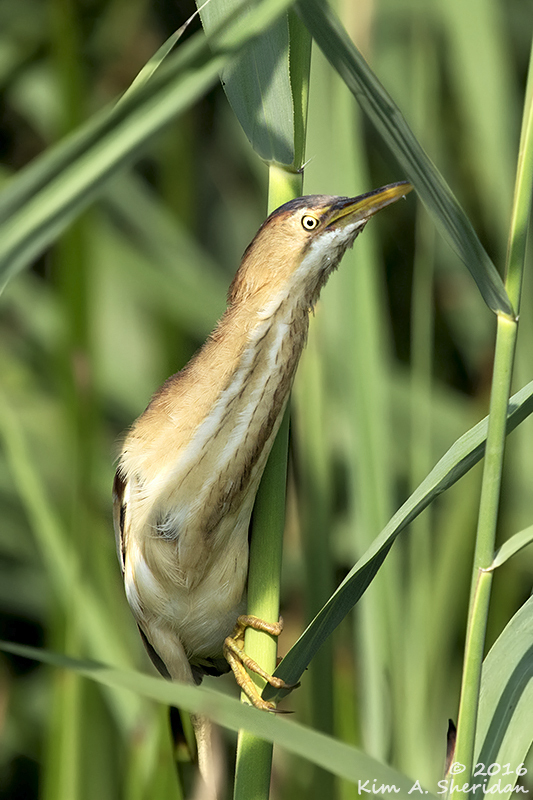 Rumor has it the Least Bitterns are also raising a family in the oh-so-exclusive conclave of The Reeds. 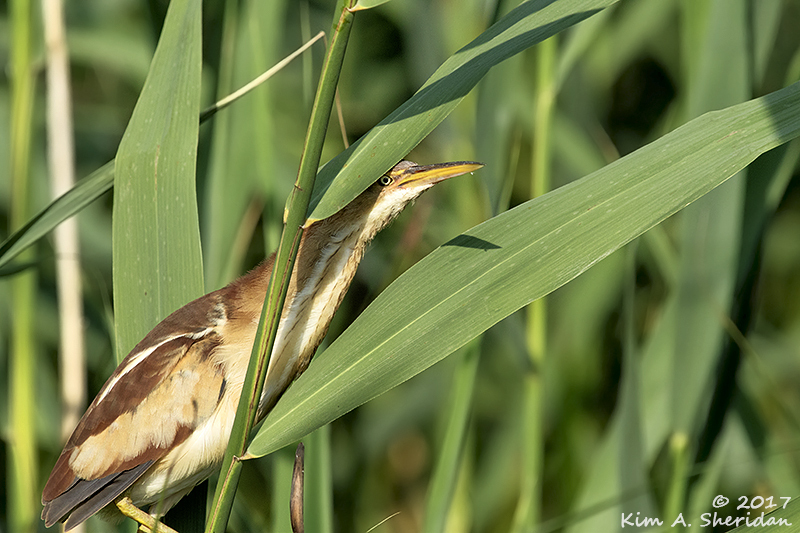 Madame hears that a few very lucky fans have caught glimpses of the bouncing baby Bitterns! There’s a new star in town, my darlings, and he’s got the Missus and the little ones in tow. 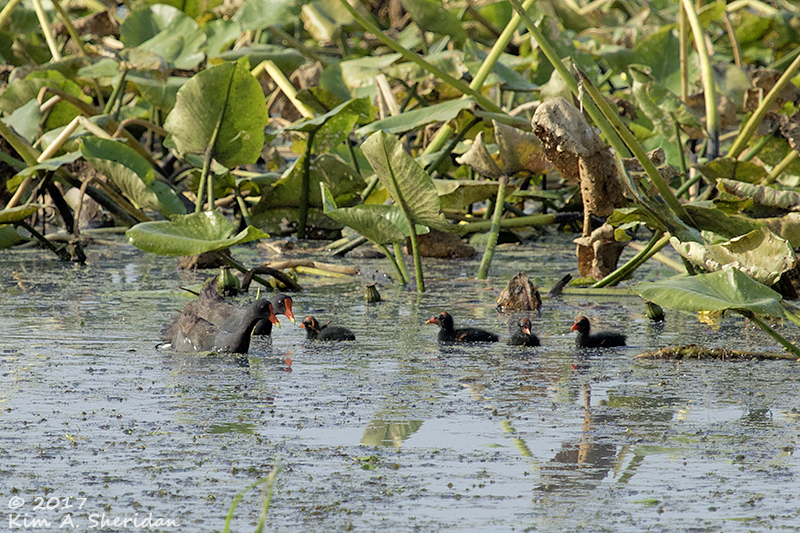 It’s been many a year since the Common Gallinules saw fit to raise a family in our neck of the woods. Why, back then they were known as the Common Moorhens, mere hoi polloi. Yet, here they are now, with a distinguished new name, mingling with the beautiful people. 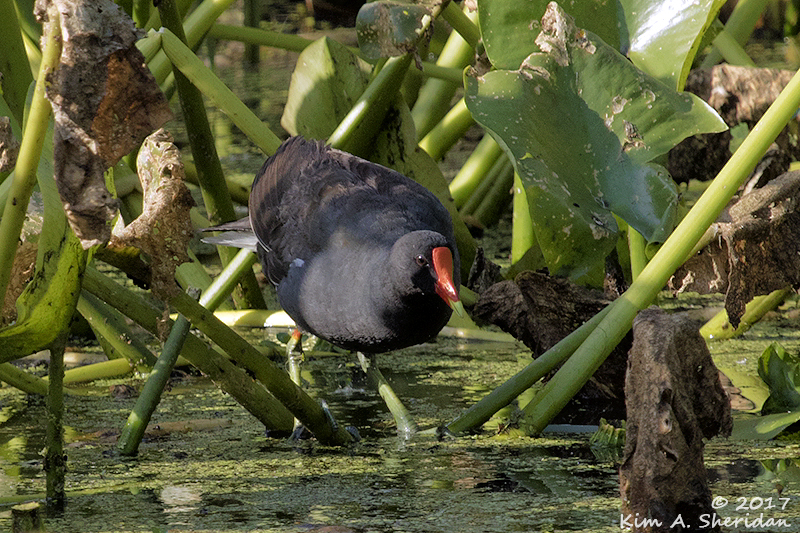 Perhaps there’s a little scandal lurking in the Gallinules’ family tree, no? 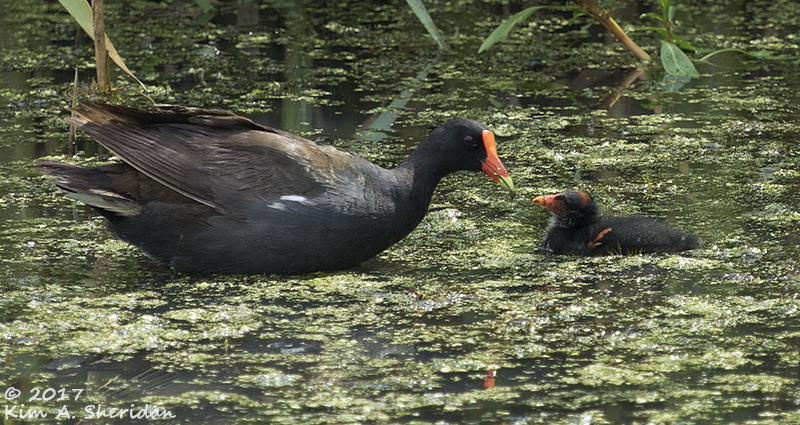 Clearly Mr. Gallinule now has exacting standards, and this elite community has met them. He’s made sure to show off his lovely mate and their four fabulous offspring frequently, parading them past the persistent paparazzi at every opportunity. Ah, a little escargot for the little cherub. Parents may crave the spotlight, but the little ones are little ones, after all, and their needs must be met. Mother and father alike see to it that the youngsters experience only the finest haute cuisine. Aren’t they just adorably ungainly at this age? Madame Catbird has many, many more delicious morsels to dish about. You say you must have more celebrity goodies? Now, now! Patience, darlings! Moderation in all things, don’t you know? Do tune in next time to find out just who has all the bees abuzz, won’t you? Madame Catbird awaits! Until we meet again, on KRTR 99.9 FM, Critter Radio. If the commonplace birds that frequent our everyday world are “ordinary”, then “extraordinary” birds must be those that are unusual or rare visitors in our lives. 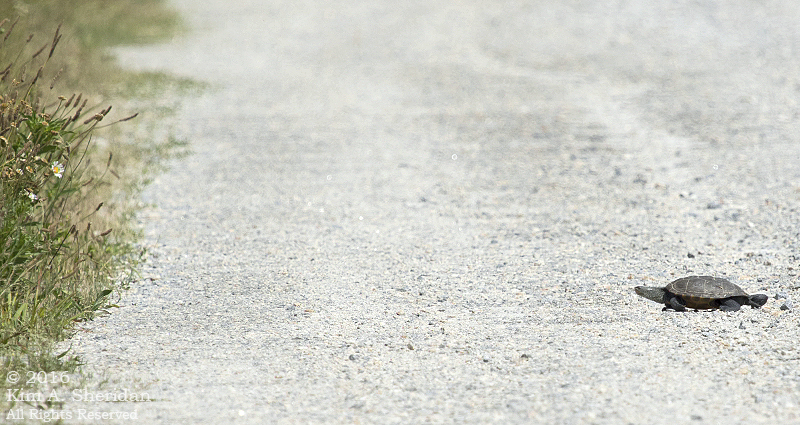 What’s ho-hum to one birder might be remarkable to another, however. Here are a few of the extraordinary birds I saw in the woods this spring, each one more special than the last. 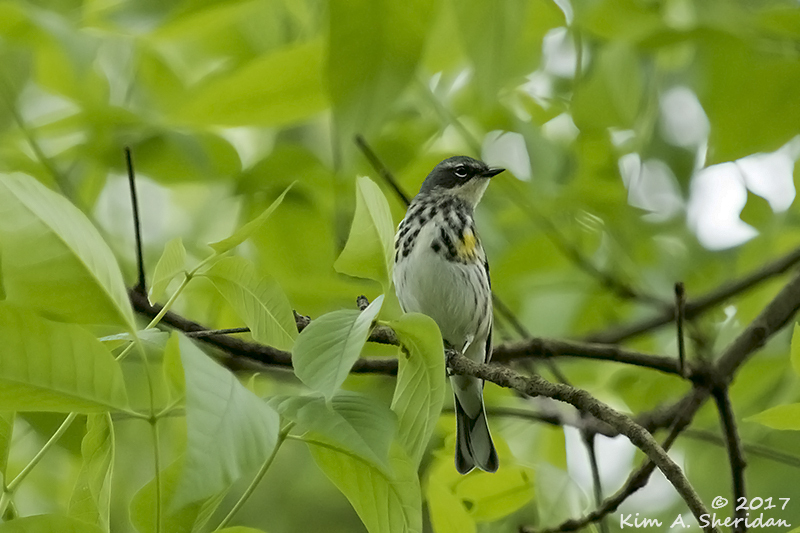 I see Yellow-rumped Warblers like the one above all the time. Common, yes, but far from ordinary. Because there’s no such thing as an ordinary bird. Yellow-rumps in breeding plumage are quite striking. 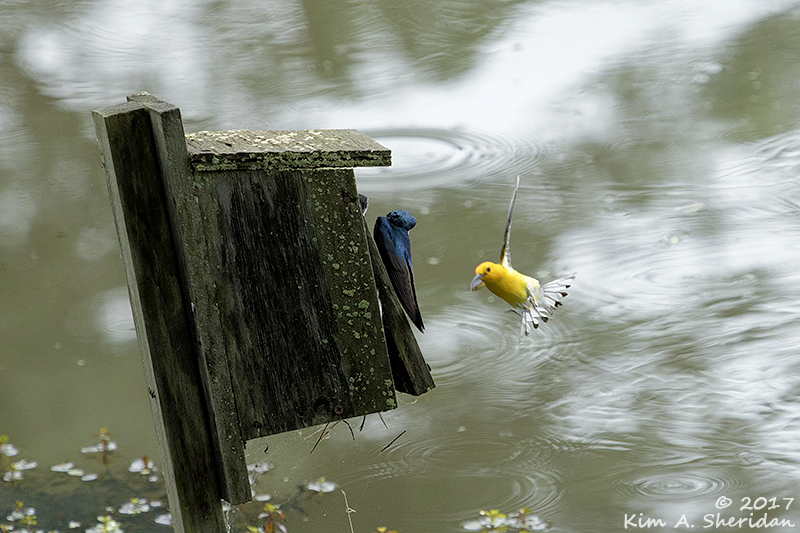 Yellow Warblers are also at Heinz NWR in large numbers in the spring. They’re plain, but very bright. And they are always cheerfully singing their little heads off. 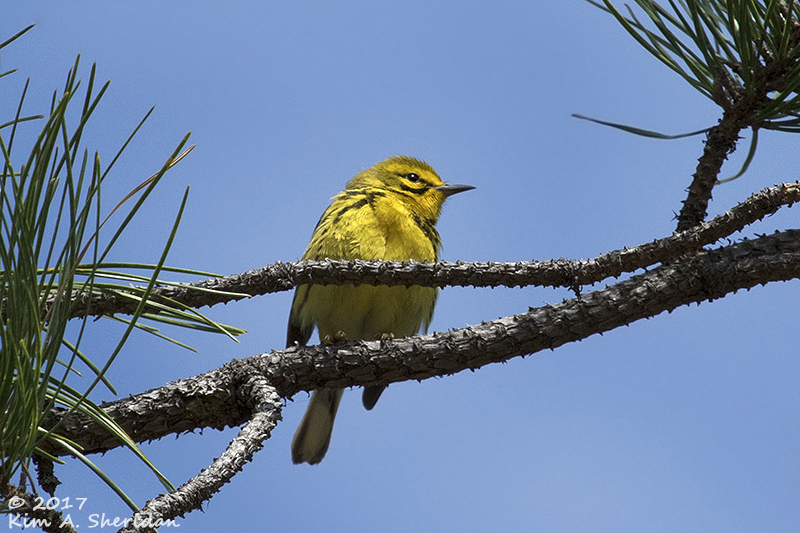 In the Pine Barrens, a Prairie Warbler spent a long time perched at the top of a pitch pine in the sun. Then he started caroling. Prairie Warblers are more frequently heard than seen, for me at least. 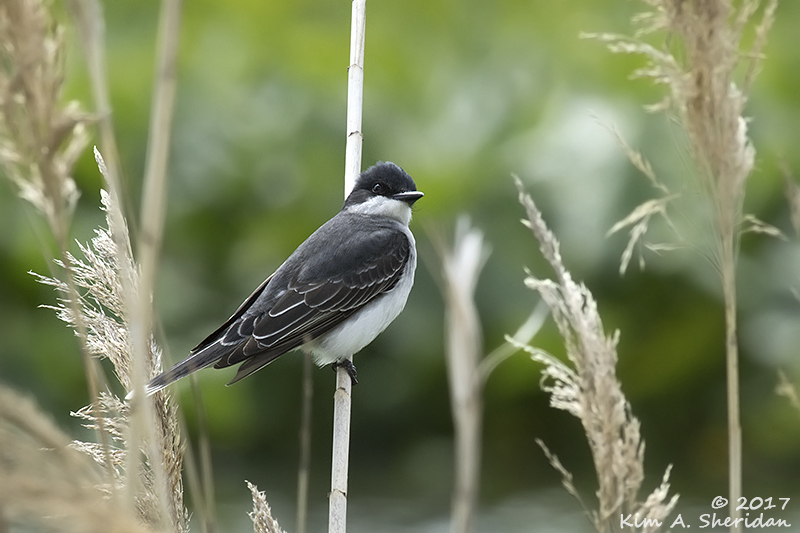 Back at Heinz, an Eastern Kingbird at the water’s edge. 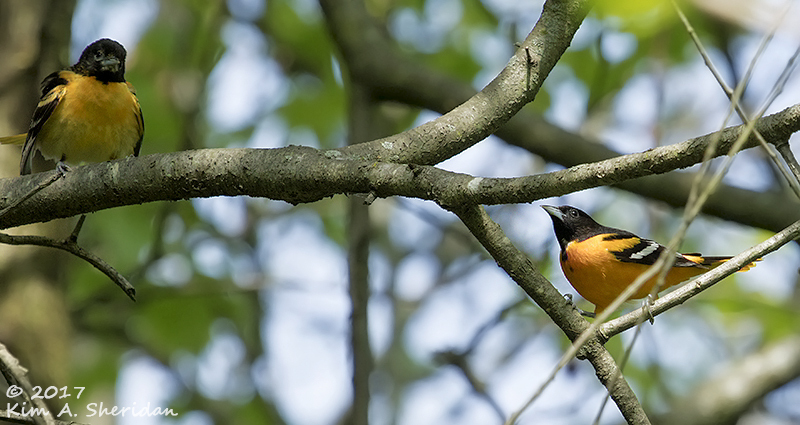 I see Baltimore Orioles from time to time in the spring. 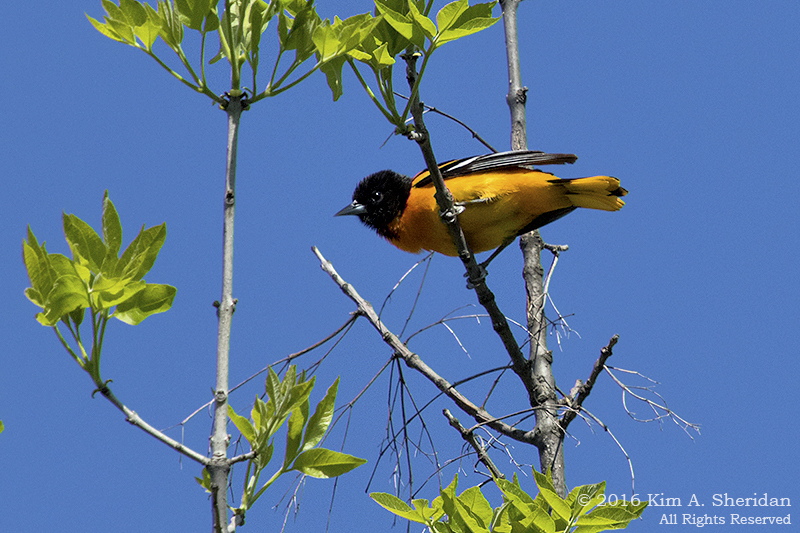 If one oriole is good, two must be better! 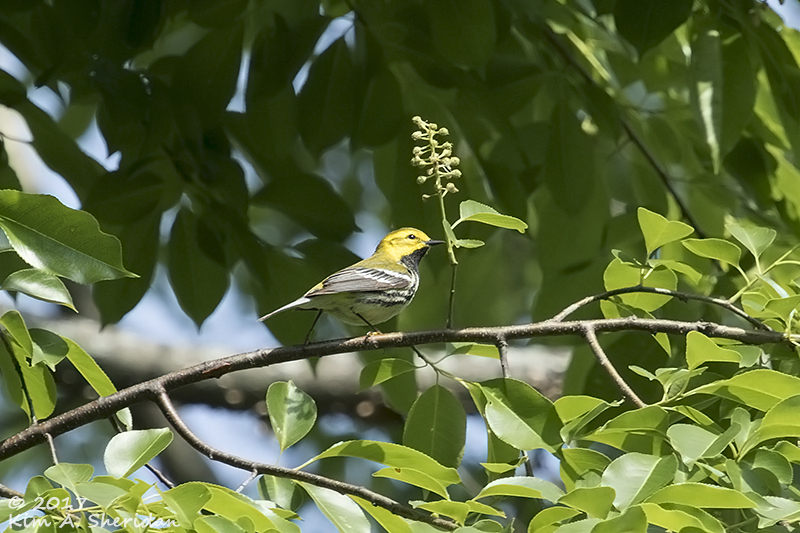 Spring migration brought the warbler hit parade to Heinz. 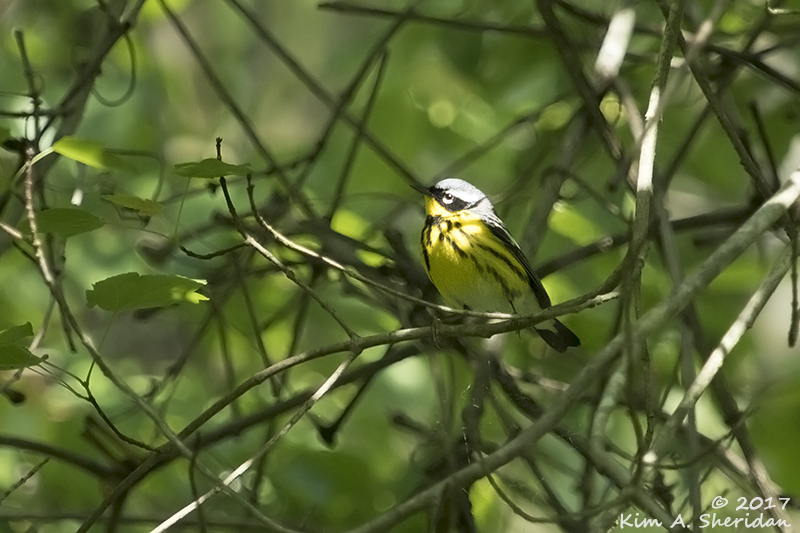 Magnolia Warbler. I don’t see Black-throated Green Warblers too often, and had never photographed one before. Catching this one was tough. It hung around for a long time, but like most warblers, it never stayed in one place, and was always just a little too far away. 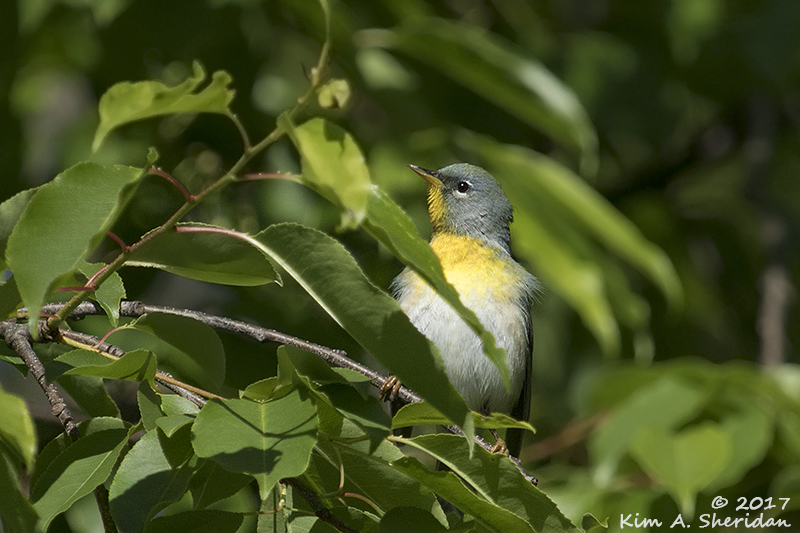 Canada Warbler. Another bird new to my photo collection, though not my life list. I can’t show you my favorite warbler of the spring. There was a brilliant Blackburnian Warbler in a treetop at Heinz. I’ve only caught brief glimpses of Blackburnians in Michigan. This time I got a good look at the bird, but you’ll have to take my word for it. He didn’t come close enough for a portrait. 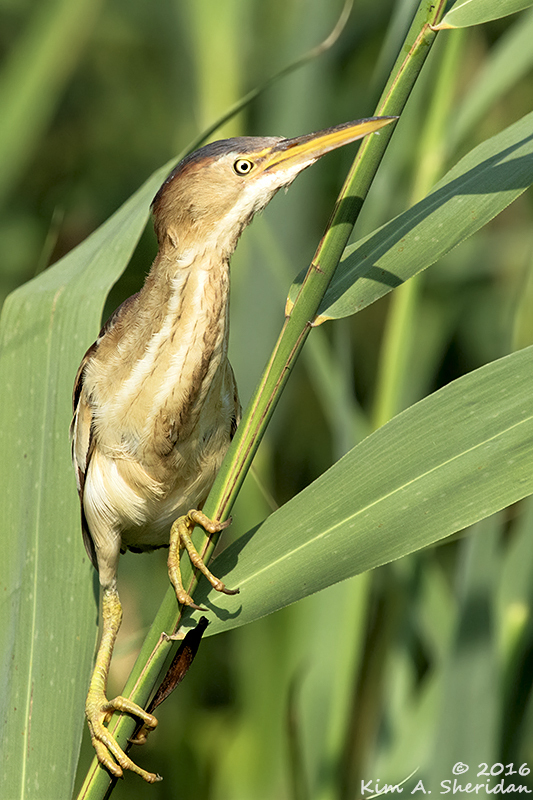 Rarer still was this bright confection in Higbee Beach WMA in New Jersey. It’s a Yellow-breasted Chat, only the second one I’ve ever seen. I was shooting here from a tall observation platform at treetop level, the perfect perch from which to watch this warbler sing and dance. Walking along the path at Cape May Point State Park, I spotted a flash of bright blue. Bluebird? Blue Jay? Tree Swallow? 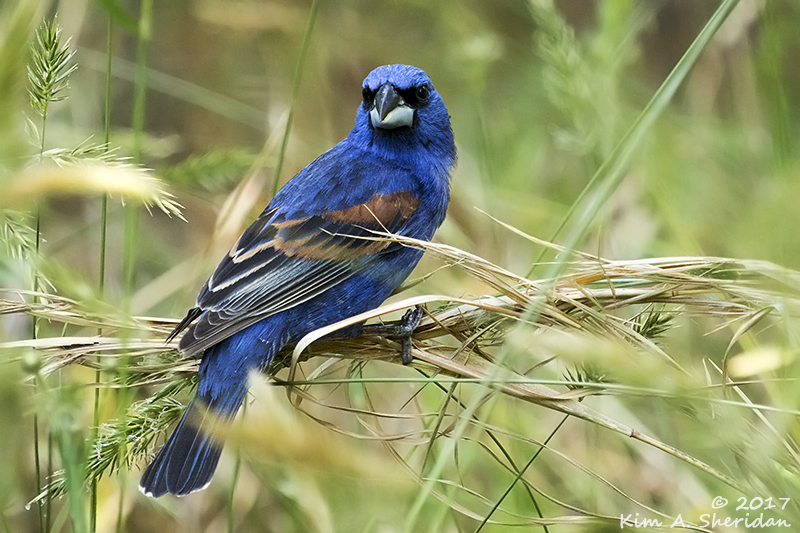 At the edge of the woods, a Blue Grosbeak was feeding on grass seeds. I’ve never seen one before. That makes this a life bird, the first one of its species I’d ever spotted. 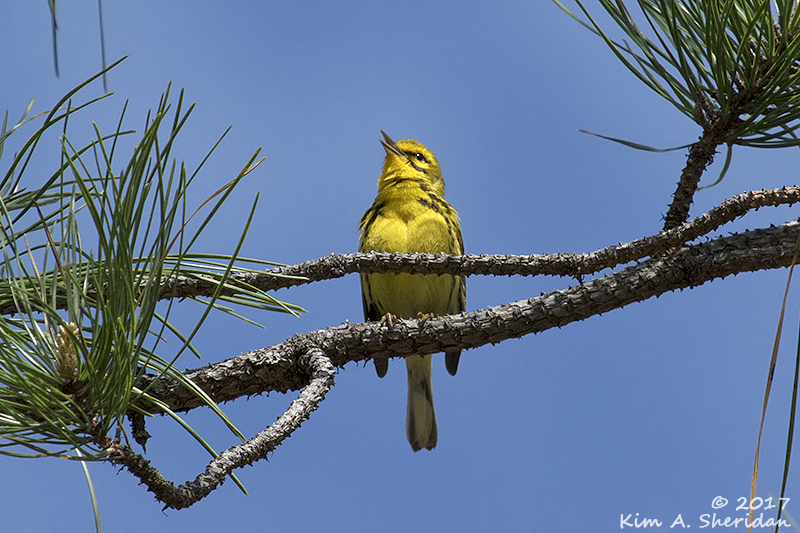 Warblers to orioles, kingbirds to grosbeaks, there’s no such thing as an ordinary bird. They’re all special in their own way. Welcome back, race fans, to the annual Turtle 200! It’s been a year since the armored beasts took to the track. We have a good lineup of reptilian racers for you today, all tuned up and ready to roar down the track at a breakneck quarter-mile an hour. You can hear all the action right here on KRTR 99.9 FM, Critter Radio. Tension is mounting! There’s quite a crowd watching the action from the turtle bleachers. They crane their necks for a better view as the competitors plod past. Every stadium has that one guy, right? Big, pushy, late to the party, he has to climb over everybody to get to his seat. 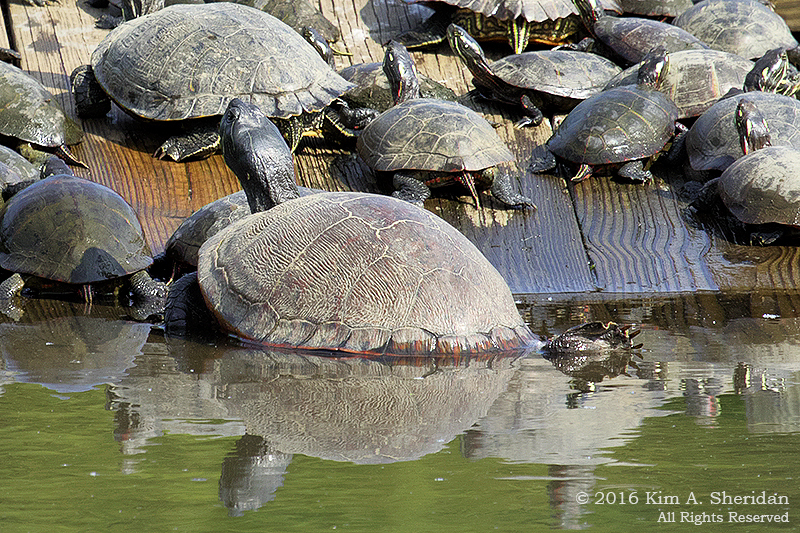 Today it’s a Red-bellied Turtle throwing his weight around amongst the smaller patrons. The Red-bellied Turtle, sometimes called a Red-bellied Cooter, likes deep water with a sandy or muddy bottom and lots of aquatic vegetation. 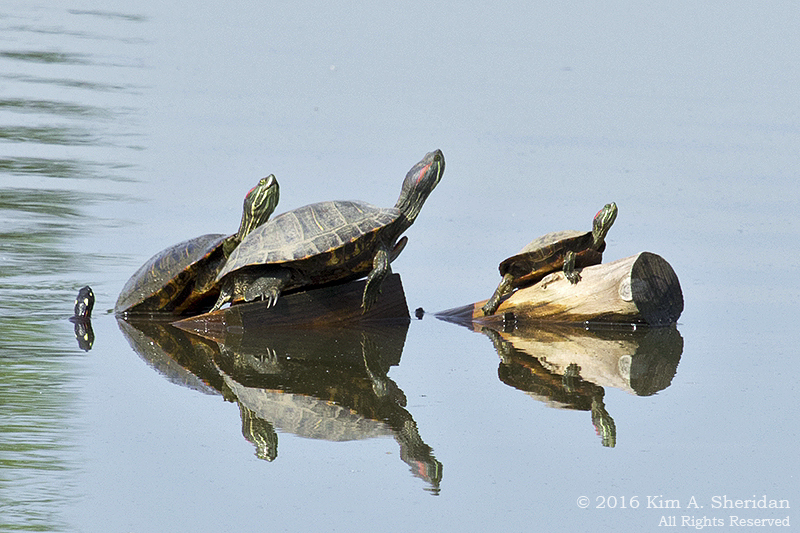 They sometimes hang out in the sun with Painted Turtles and Red-eared Sliders, but they are much larger. They are distinguished by their reddish plastron, the lower shell. 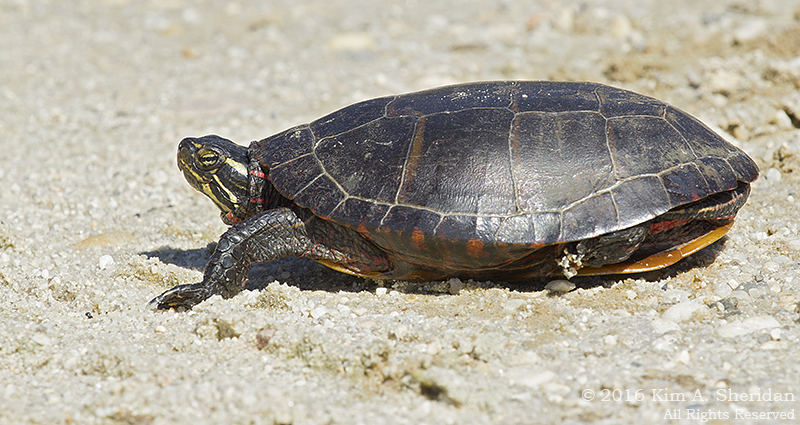 Red-bellied Turtles are listed as a threatened species in Pennsylvania. 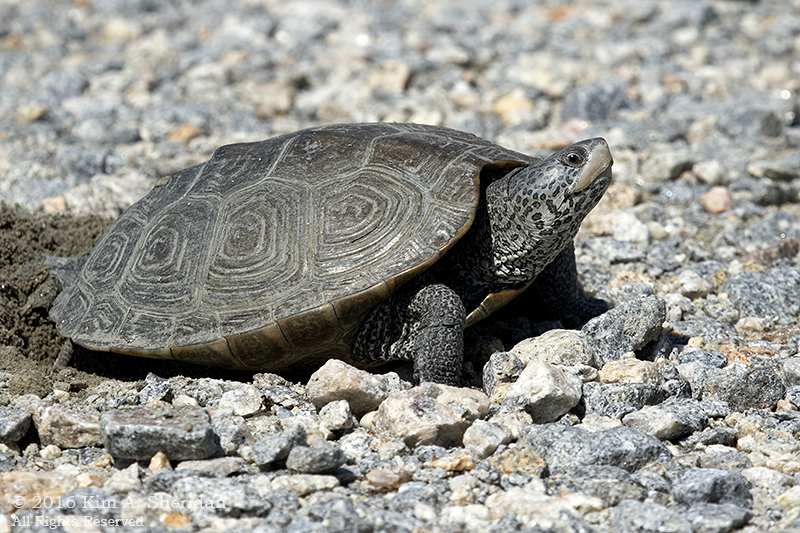 Loss of habitat is taking its toll, as is nest predation, road mortality when females come on land to lay eggs, and competition with the exotic Red-eared Slider. Here we go, fans! 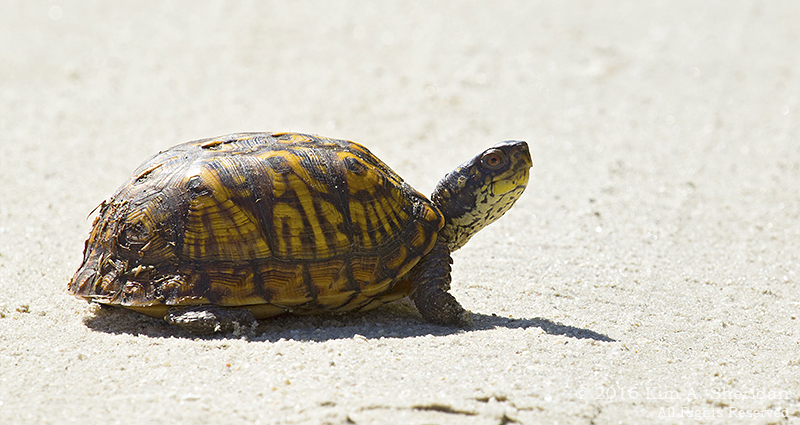 Coming into the first turn is an Eastern Box Turtle. Surprising to see him in the lead. 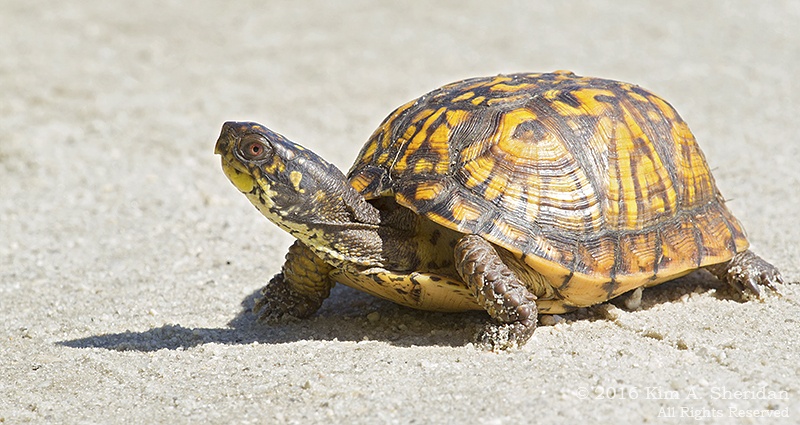 Box Turtles are known to be particularly slow, which is saying something when you’re talking about turtles. Look at the domed carapace (upper shell) on this guy! Looks like he’s made the turn safely. He was really pulling those Gs though! This Painted Turtle shows some uniquely beautiful markings as he strains his neck going around the curve. 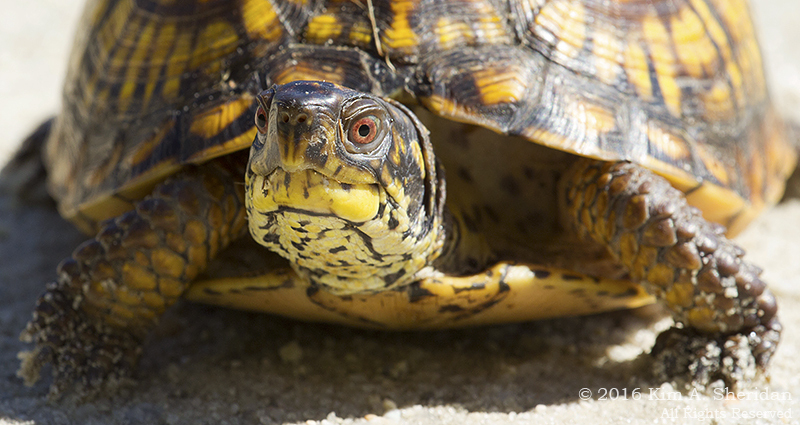 FUN FACT: A few species of turtles have an eye stripe like this. A fellow photographer pointed out that, no matter what angle the head and neck are, that eye line is always parallel with the horizon. Wait! The Caution flag is up! Seems we’ve got a three turtle pileup of Red-eared Sliders on the track. 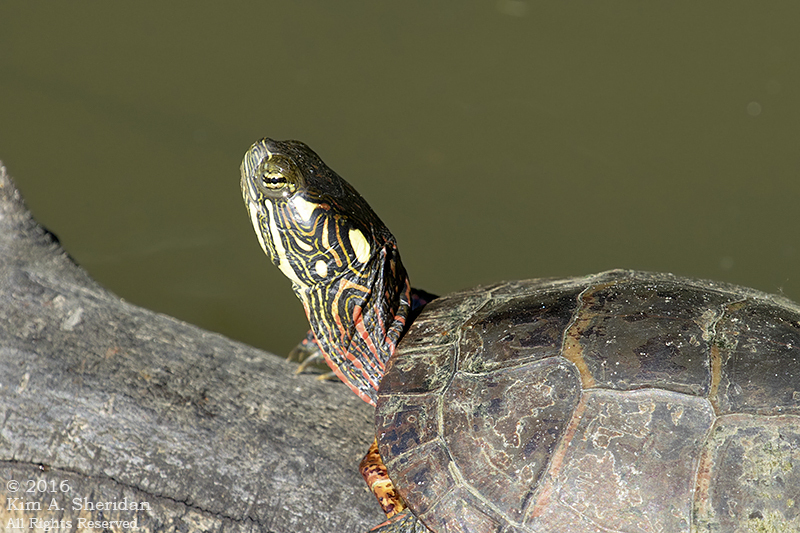 Red-eared Sliders look quite similar to Painted Turtles, and the two species frequently sun together. The red stripe on the side of the Slider’s head gives it away. They don’t belong here; they are native to the Mississippi River Basin. But they are popular pets, and frequently released into the wild, so that they have become established throughout the country. 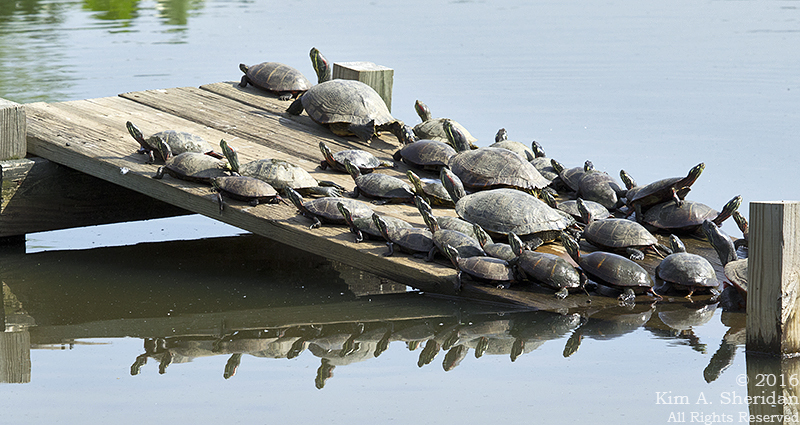 They often out-compete other turtles, the hallmark of an invasive species. Now we’ve got a green flag, we’re back to racing. 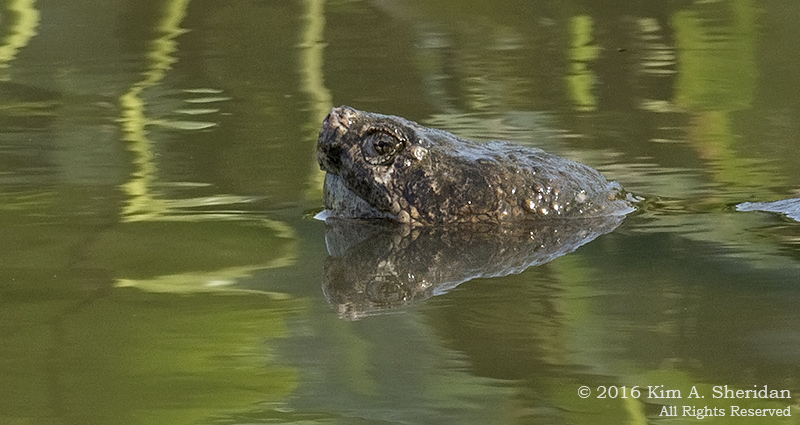 A snapping turtle has lumbered into the lead. This is one BIG turtle! They can reach 60 pounds. Everything about them, from their heads to their claws, is huge. You don’t want to get near their powerful jaws. The Snapper meanders on down the track, dragging his very impressive tail behind him. The White flag is up – it’s the final lap. 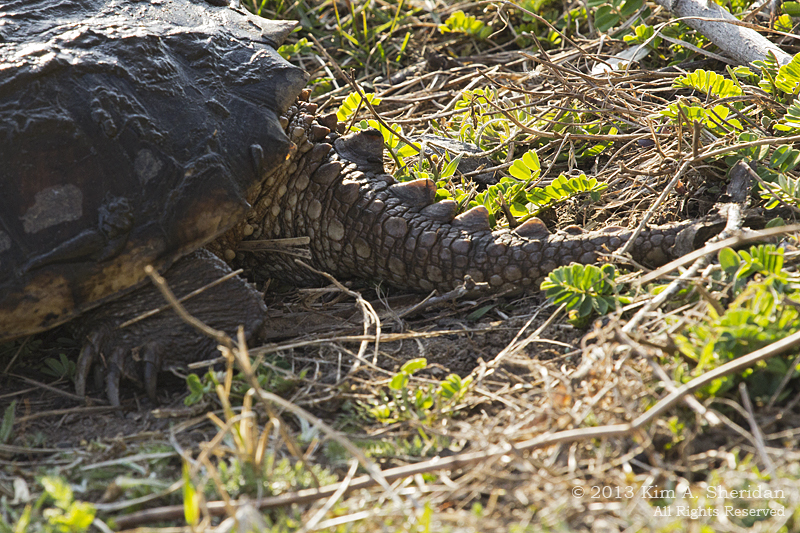 A Diamondback Terrapin moseys toward the finish line. …AND she’s pulling over for a pit stop. In an actual pit, which she’s digging herself to lay her eggs. Right in the road. Track managers frown on this type of behavior; it makes a mess for the grounds crew to clean up. In the meantime, this beautiful female has cost herself the trophy. 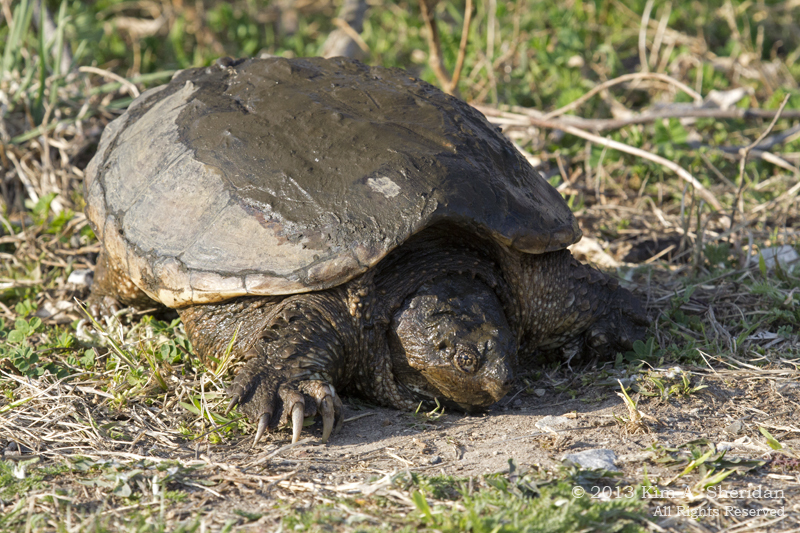 Diamondback Terrapins are turtles of brackish estuaries, tidal creeks and marshes. They are the only turtles in the country that live in water with a salt content between that of fresh and salty seawater. Population numbers are dropping due to habitat loss, and predation. Females crossing roads to lay eggs are killed by cars, they are collected illegally for the pet trade, and frequently drown in commercial crab traps. Numerous conservation programs are trying to help these beautiful turtles. Oh, the drama! The Snapper had the finish line in his sights, only to be passed by a Painted Turtle in the last few yards as the checkered flag waves. There’s your winner, folks: the Painted Turtle has taken the coveted Turtle 200 Cup! That’s another fine race in the history books. Don’t miss next year’s competition, brought to you by KRTR 99.9 FM, Critter Radio. It’s sure to be another nail-biter! A “Big Day” in bird-watching parlance is a day when a group of birders try to see as many different species of birds as they can. Recently, I had a different kind of Big Day. My life list on May 13 consisted of 211 different bird species. On May 14, it was up to 217. That’s a big jump. How? I saw six new birds in ONE day, that’s how. My BIG DAY. But do I have photographic evidence? No! b) there are plenty of birds, but they are moving so rapidly deep in the dark treetops that all of your images are rubbish. 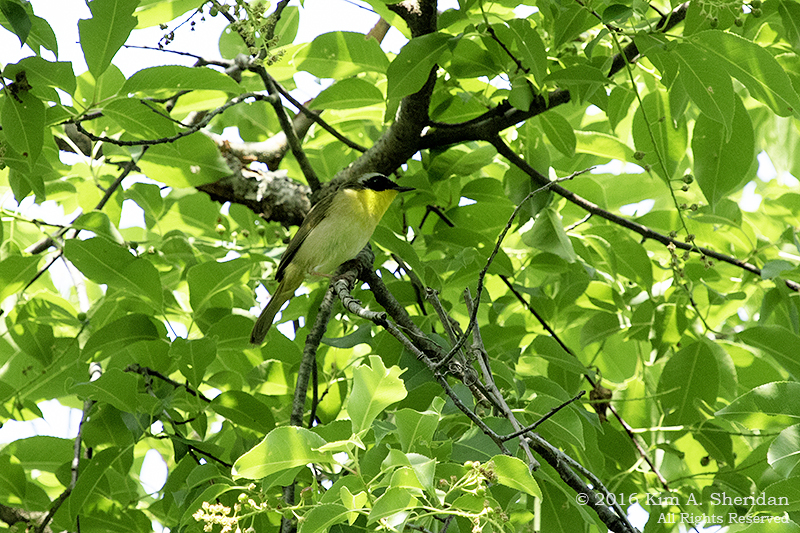 Like this Common Yellowthroat, so buried in the foliage that its light underparts look green from the reflection of the leaves. 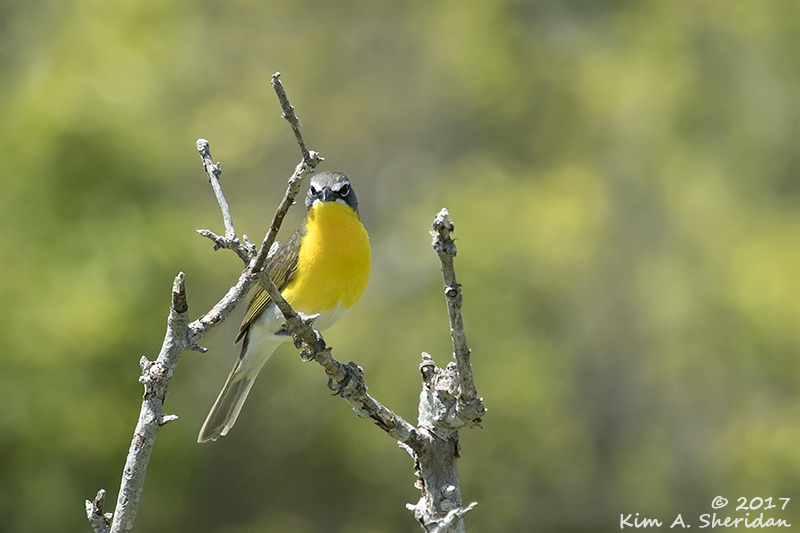 Common Yellowthroats, as their name implies, are pretty common. One hopped across my porch while I was reading one evening. I enjoy seeing them each year, but this was not a new species, a “life bird”, for me. 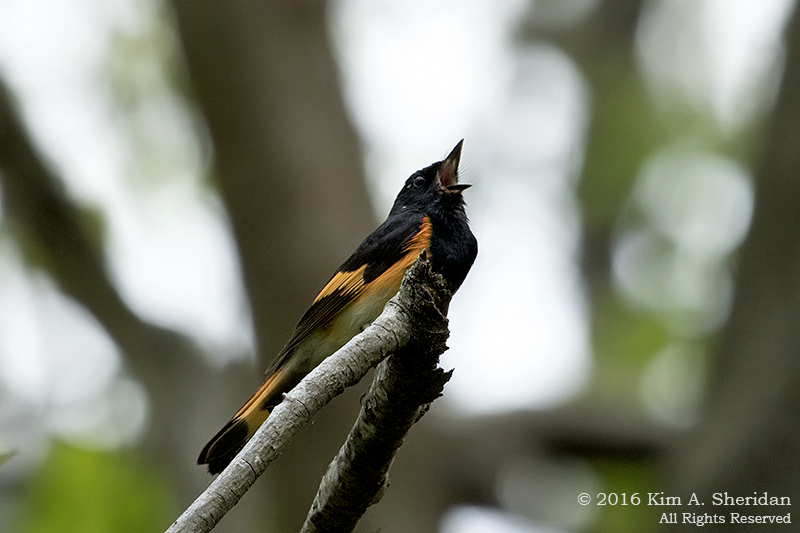 Here’s a bird in the open, an American Redstart. Great bird, horribly distracting background, too bright. Another common warbler I’ve seen before this year. 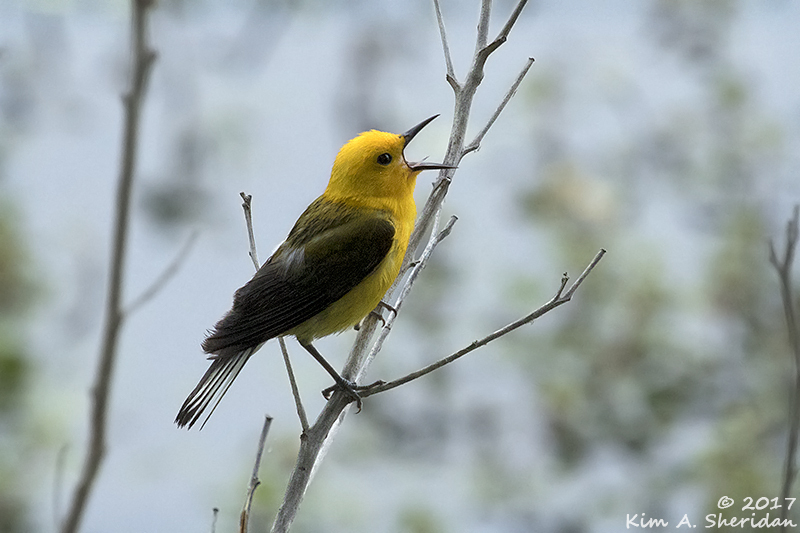 John Heinz National Wildlife Refuge is a hotspot for migrating warblers, flycatchers, vireos and other birds in the spring. Many of the local birders said this was the best spring migration we’d had in some years. Murphy’s Law of Bird Photography, Corollary #1: Go birding WITHOUT the camera, and the birds will sit in the open in beautiful light, singing their hearts out. See the above incident on the porch. Great bird, really close, no camera. 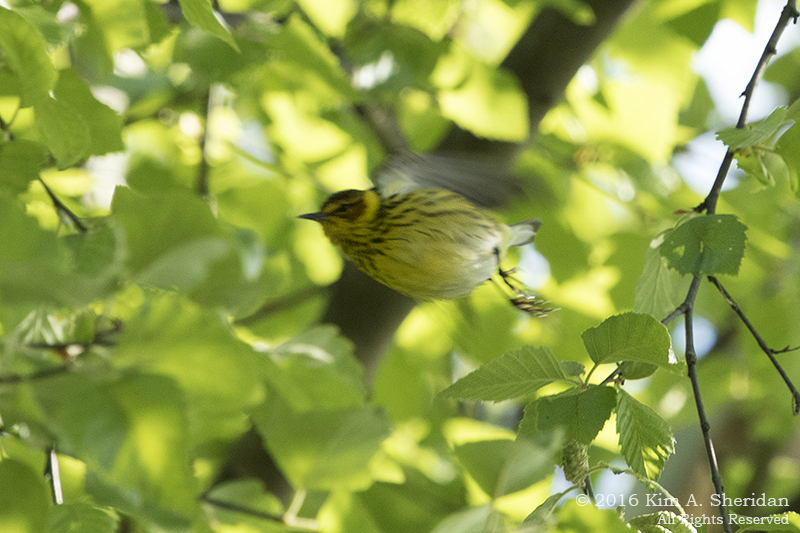 Here’s the one life bird I saw this spring I managed to capture, a Cape May Warbler. I first saw it the day before at eye level, in the sun, singing away. But, alas, no camera. I found it again the next day with camera in hand; this time it was hidden in the trees. 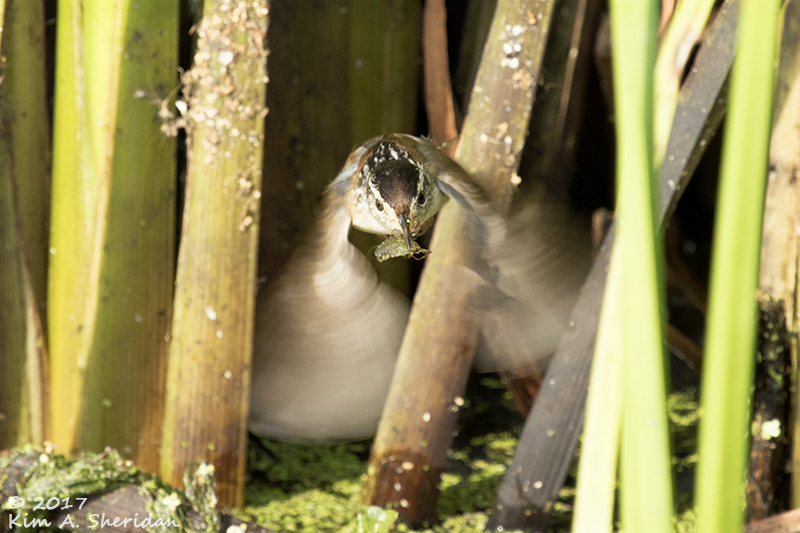 I finally caught it in a blur of motion. This nicely illustrates one of the habits that make warblers so difficult to photograph: they never stay still! 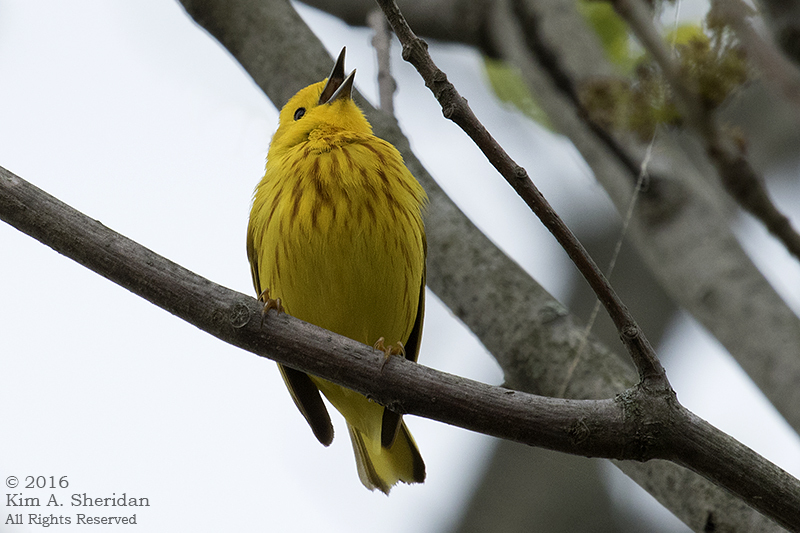 Murphy’s Law of Bird Photography, Corollary #2: Have a Big Day, in which you see SIX new species of warblers, and your only passable images will be of the ubiquitous Yellow Warblers. All thanks to Murphy’s Law of Bird Photography or Corollary #1. 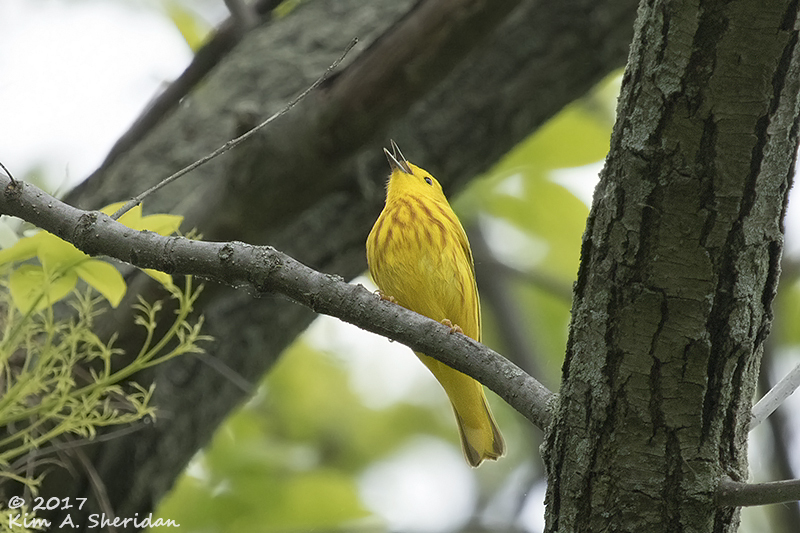 Here’s that ubiquitous Yellow Warbler. Notice how all of my images are of the birds’ tummies? Another warbler habit: Most species like to hang out high in the trees. To see many of them you need to tilt your head way, way back. 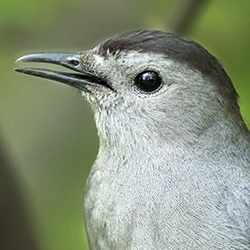 There’s a reason warbler fans complain of “Warbler Neck.” Most of my images are of birds that hang out a little lower in the canopy. For those curious to know, my new birds this May were the Blue-winged, Cape May, Wilson’s, Blackpoll, Chestnut-sided and Canada Warblers and the Northern Parula. All but the Blue-winged seen in one day. Murphy’s Law of Bird Photography, Corollary #3: Have a bird pose in the open for you to photograph, and that’s the bird that might have been a lifer, but you’ll never know for sure what it was. 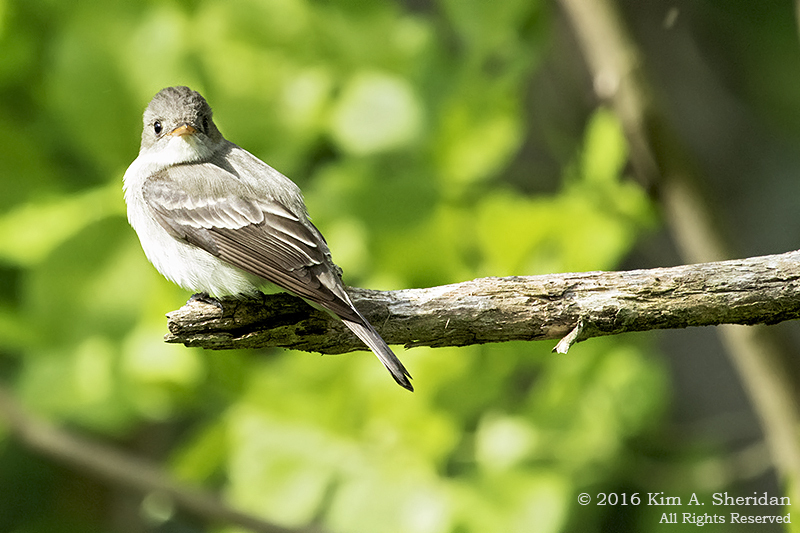 I was with one of the Refuge’s finest birders, and she wasn’t willing to say definitively which flycatcher this was without hearing it sing. Despite posing for a long time in the open, it never opened its mouth. It was a real treat to bird with Edie, though. Birding with friends was the only reason I was able to add so many new life birds to my list. I wouldn’t have found some of them if other pairs of eyes hadn’t been searching too. I wouldn’t have been able to identify some of them if others hadn’t helped me out. 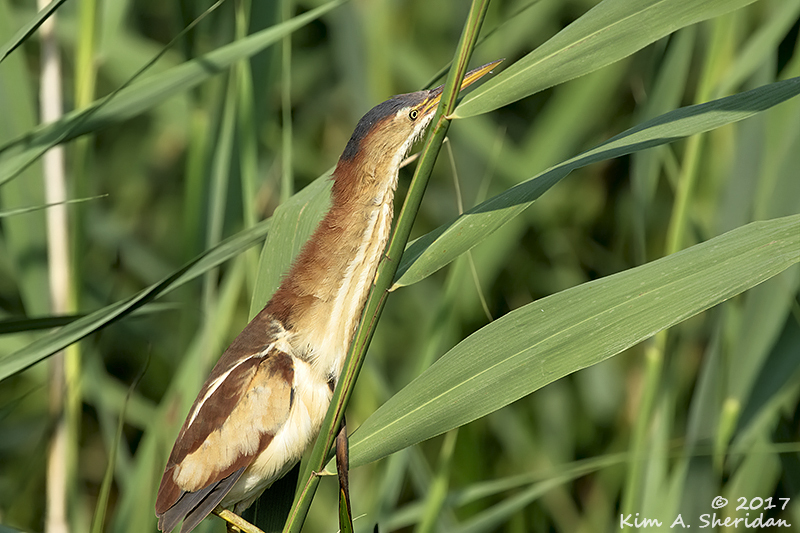 There are other birds at the Refuge that are easier to see and photograph. Baltimore Orioles are stunning at this time of year. 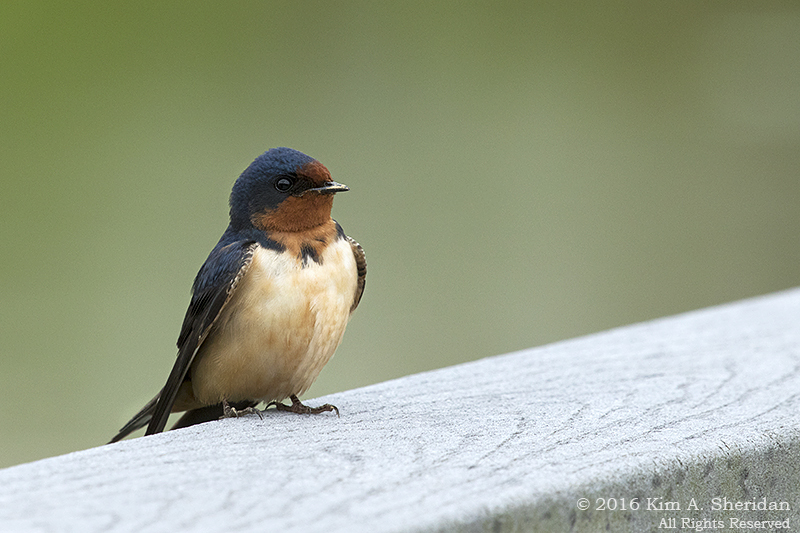 Barn Swallows are everywhere. Trying to capture them in flight is nearly impossible. But they’re not shy when they’re sitting on the boardwalk railing. 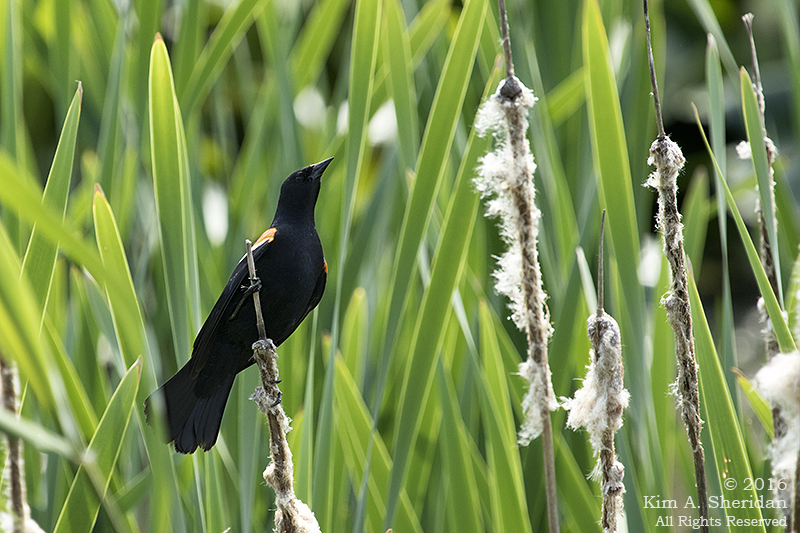 Red-winged Blackbirds are another common bird that I keep hoping to capture in flight. Sitting among the cattails will have to do. 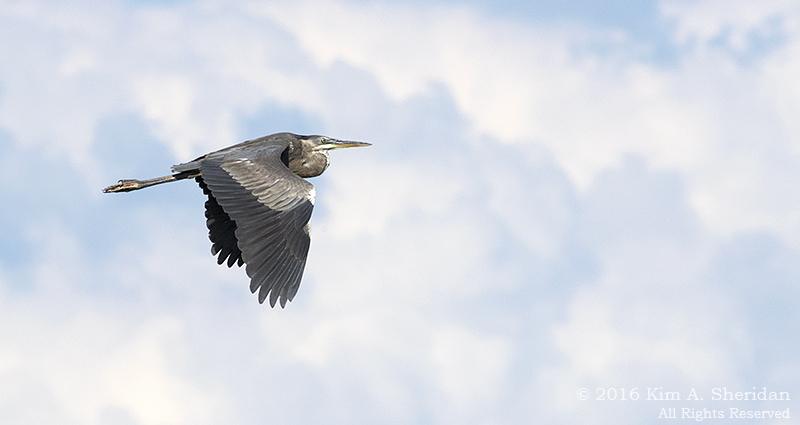 Speaking of common birds in flight at the Refuge, that’s a Great Blue Heron at the top of this post. I’ve been trying to photograph male Wood Ducks in their elaborate breeding plumage for a long time, not particularly successfully. I’ll take the ducklings any day of the week, though. 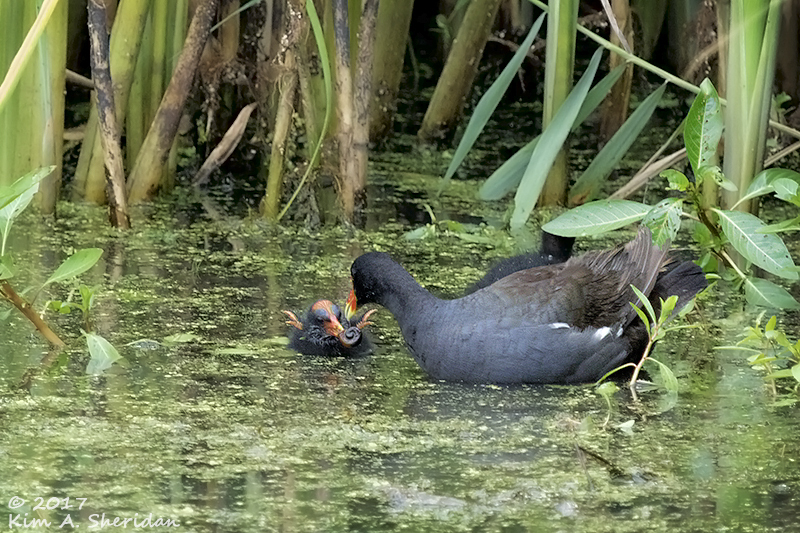 They’re hot on Mama’s tail as she paddles for the safety of the spatterdock. 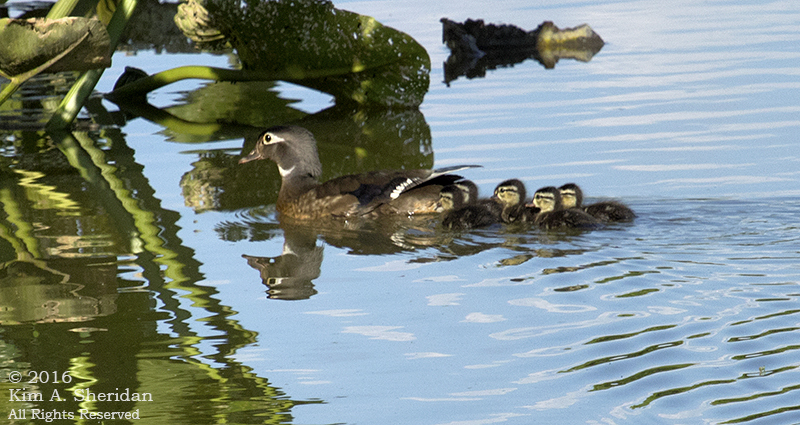 Every day’s a Big Day for Mama Wood Duck. Every day that I am outside observing and enjoying Nature is a Big Day for me.